The multitalented Australian author of The Thorn Birds died last week. Australian author Colleen McCullough died at age 77 Thursday in a hospital on Norfolk Island where she had live for more than 20 years. Her publisher, Harper Collins, made the announcement. McCullough had suffered from poor health and arthritis for some time, though she was working on a follow up to her last novel. McCullough is best known for her novel The Thorn Birds, which sold 30 million copies worldwide. Published in 1977, the book detailed the lives of a family on a remote outback cattle station (what Americans would call a “ranch”) in Australia. The rights were sold for a then-fantastic $1.9 million in 1983, and the book was turned into a hugely successful television miniseries. McCullough published her last book, Bittersweet, in 2013. McCullough was a woman of many talents, teaching herself to read by the age of three and studying medicine – though forsaking a medical career thanks to a soap allergy. She spent some years as a neuroscientist and then a researcher at Yale Medical School in the United States, where she began to write her first novel, Tim. That also became a film, starring a young Mel Gibson. 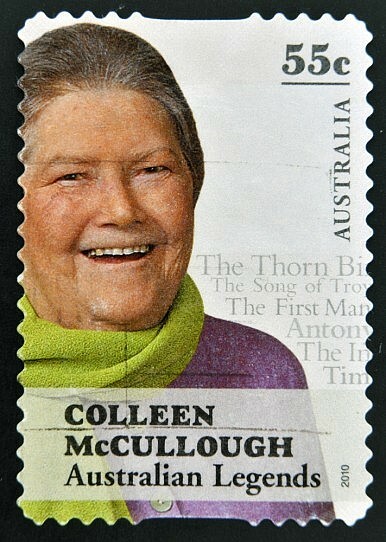 As Harper Collins said of her, “She was one of the first Australian writers to succeed on the world stage.” Apart from literary plaudits, McCullough received the Order of Australia, has been the subject of an Archibald Prize entry (the Archibald is one of Australia’s highest profile art awards), and was immortalized on a postage stamp.